SQL injection – Java, SQL and jOOQ. Thanks to the generous contributions of Timur Shaidullin, jOOQ 3.11 will now support GRANT and REVOKE statements through #6812. While implementing integration tests for these new features, I had researched the different ways how these statements work on a variety of databases, and the good news is, they’re all mostly quite standardised (in fact, they’re even part of the SQL standard). The less good news is that a lot of people do not seem to care about security – at all! But I don’t want to do that! That’s already much too big of a GRANT for the fact that I don’t actually want this user to be able to do anything at this point. Note, with my security background and being the pessimist I am, I don’t even grant the SELECT privilege on this view, but just the SHOW VIEW privilege. I could possibly live with that. Or if I cannot create any view myself, perhaps I could grant “SHOW VIEW” of all views. I don’t like that thought, but it seems to be about the least intrusive privilege to get that implied “CONNECT” privilege. OK, perhaps not the best first example, I mean I really don’t trust this guy finley. But OK, it’s the manual and it later proceeds to showing more restrictive GRANT options. Great, so now we know that this particular user can do everything on this forum. Excellent. Let’s find a SQLi vulnerability somewhere. Great, so qorbit_store also has a user with total privileges. So… this is the travis CI server itself, isn’t it? mysql -u root -e "CREATE DATABASE mydb;"
What are you folks thinking?? “Proper permissions” – GRANT ALL is never proper! If you want (or need) to be more restrictive with database permissions: You will need to at least grant the ALTER, CREATE, DELETE, INSERT, SELECT, and UPDATE permissions to your database user. ALTER and CREATE permissions are only needed for installing and upgrading Geeklog, as well as for installing plugins and other add-ons. But as we’ve seen before, people don’t read all that advice, they just use the first thing that works. In case you wondered, this emoji is me losing faith in humanity. Not a single post recommended first to grant the minimal rights necessary for the user. All of them (including the official documentation) just defaulted to granting everything. For crying out loud. I googled for an error message about being unable to connect, and almost every single answer Google gave me was someone recommending to just GRANT ALL. That’s like googling for an alternative to tacos and being recommended to join the NASA / SpaceX missions to Mars because of the excellent astronaut food. "If you're open to an alternative to tacos, living on Mars offers you an endless supply of NASA and/or SpaceX astronaut food"
Of course, as a developer we like to GRANT ALL. That’s convenient. If we don’t ship to production but just want to play around with some features, we might not need security. But the fact is that if the readers of such posts are never exposed to even the mere idea of thinking about a security model and user design where not every user can access (let alone modify, drop, shutdown) every resource, then these readers are simply going to ship GRANT ALL to production. SQL injection is a serious threat on its own, but if the database user that exposes the vulnerability has complete privileges on your database, then you’re doubly doomed. Always start with users that have no rights – then add rights as you need them, and add them sparingly! Security is a feature that is often neglected until it’s too late. And when it’s too late, it is often hard to bake it into a well-established architecture without major refactoring efforts. Security is a cultural thing. Either, a company has security in their DNA, or it doesn’t. The same is true for scalability, or user experience, or any other aspect of software engineering. I’ve worked for companies that are at completely opposite ends of security awareness. Some (in the E-Banking field) were ultra-paranoiac, implementing thorough security checks in around 7 layers of the application. Others were rather lenient with management focusing much more on marketing than anything else. Without any empirical evidence, however, there was a certain correlation between security-awareness in a company and the backend-orientedness of the same company, E-Banking being a very backend-oriented business. This is an over-generalisation and probably doesn’t do justice to many excellent frontend developers out there, but security is where the data is. Where the algorithms are. Where people reason about constraints, workflows, batch jobs, accounting, money, … algorithms. These folks focus on all the users. On the system. And they want to protect it. On the flip side, they might neglect usability. There is only little security-awareness where the user experience is. Where people reason about layout, formatting, usability, style, … user interfaces. These folks focus on single users. On their experience. And they want to make things easy for the user. It is no coincidence that backend technology evolves extremely slowly. Java: 20 years and we’ve just finally gotten lambdas. SQL: 30 years and we still don’t have easy ways to reuse code. At the same time, frontend technology evolves at the “speed of reddit”. The next hype is just 100 karma away, and we’ll throw all the previous tech out of the window, just to be part of the game. Clearly, security is something that has to be reasoned about way too thoroughly for it to survive in the fast-paced frontend world. What does MongoDB have to do with it? This time, the anti-RDBMS marketing resonated mostly with frontend developers, obviously, because JSON is their favourite data representation format, and MongoDB promised to be able to store data directly from the DOM into the DB. Not only did this mean “the end of the DBA” for some software vendors, but many vendors also hoped that they could omit operations, and perhaps even backend development. What obviously worked well for prototyping and simple applications doesn’t scale well to applications with sensitive data. The solution is obvious. Homogeneity kills your business. You should hire a variety of different types of personnel. You should have skilled frontend developers, backend developers, operations people, DBA, and security experts on your team. You should make them work all together, hear each of their opinions, review each others’ code, learn from each other. Because each one of them has a strong focus and interest on an entirely different, yet equally important aspect of your application. Do not neglect any of these aspects. Because if you do, and if it’s security, and if you lose sensitive customer data – well, you’re not going to stay in business, you’ll be sued in court. Got hooked on the security topic? The threat caused by SQL injection is heavily underestimated even by many senior developers and software architects. Most people are unaware of the fact that an entire server can be at risk by a single vulnerability even in the remotest piece of logic. This article will give a frightening insight into the potential severity of SQL injection vulnerabilities. 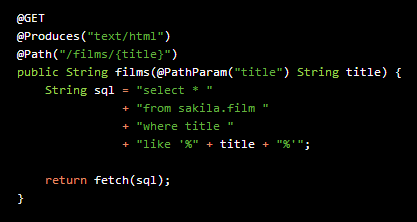 It is easy to see that when substituted into the previous SQL statement, this “title” will result in always selecting all films. Another, famous example of how this can go wrong is xkcd’s famous Little Bobby Tables strip. The above introduction shows that SQL injection is possible and quite simple to exploit, manually, if the server side source code is well known. Finding such a vulnerability in a huge application with thousands of SQL statements, however, is a lot of work. Besides, there are much more subtle vulnerabilities than the obvious pattern matching search. sqlmap is an Open Source, GPLv2 licensed tool for automating such searches. With a total of 59 HTTP requests (among which 41 resulted in HTTP 500 errors), sqlmap was capable of detecting the nature of the vulnerability of my SQL statement, and it also figured out the database server and version. Note that sqlmap logs everything it learns in a local SQLite database, such that it can keep the number of HTTP requests as small as possible. This is important for an attacker, as frequent HTTP 404 or 500 statuses will eventually trigger attention by maintenance personnel at the server side. Again, the information of interest is wrapped between delimiters. The above query checks if the first schema (LIMIT 0, 1) has a letter higher than ASCII code 120 (ORD) at position 13 (MID). This is a lot slower and more visible in server logs than before, but it can still produce the result. As can be seen, the above queries run for N or N + 5 seconds, where N is the amount of time the actual query takes. If N is sufficiently stable, delay-based binary searches can be performed to discover database names letter by letter. This takes very long, as each row and each column is fetched through at least one single query. But eventually, I get a nice CSV file of the complete contents. Needless to say that this could be your application’s credit card information, or other sensitive or classified data. Not all queries are syntactically injectable into all vulnerabilities on all RDBMS. But the Little Bobby Tables example is not what most intruders are after anyway: Causing damage to your system. Most intruders do not want to be seen in order to be able to silently steal your data. On a less serious note, sqlmap can be an excellent database server administration tool, should you have forgotten the credentials of your own local database development environment! In principle, it is almost impossible to completely prevent vulnerabilities involving SQL. SQL is a dynamically interpreted language and as such, it is much more vulnerable to code injection than static languages like Java. In particular, it is extremely vulnerable as it is a common practice to perform dynamic SQL based on user input criteria, such as search criteria. Obviously, other server-side interpreted languages are equally vulnerable, but SQL also happens to be one of the most popular ones. However, taking the right measures will make it very hard for an intruder to actually find a vulnerability and exploit it without you noticing their activities first. Remember, the less information you display the longer sqlmap takes and the more traces it leaves in your server logs to even verify if a vulnerability is present. First and most importantly: Never ever trust user input. Even if your application is only used by 10 users from the same company via intranet, your database might contain salaries or other sensitive data, and a malicious employee can dump such data. Note that user input should not be trusted in other scenarios either, e.g. when accessing the file system. Not only should you distrust user input, you should also use as little user input as possible directly in your SQL. For example, if users can make a choice in an HTML dropdown. Instead of simply embedding the HTTP POST parameter value into your SQL statement, parse it first and encapsulate it in an appropriate pre-defined type. In Java, a good match for HTML options could be an enum type. You know your data best, and thus, you should validate all user input on the server, immediately after receiving it. Try to express your SQL statements as statically as possible. SQL string concatenation makes it very easy for junior developers to make mistakes. If you are an engineering team leader, it is your responsibility to help your team members avoid such mistakes. The simplest way to prevent SQL injection is by using bind variables. JDBC drivers (if you’re operating with Java) and databases have very few bugs in that area, such that streaming bind variables to the database will not generate any easily exploitable vulnerability. If you are using Java and JDBC directly, you may be able to detect some vulnerabilities using static code analysis tools, such as FindBugs™ or Alvor. Obviously, such tools can only detect SQL injection when SQL statements are “relatively static”. If you distribute SQL criteria string generation over several code modules, it is not possible for a static code analysis tool, to detect vulnerabilities. sqlmap is not necessarily a tool for malicious activities. It is free and Open Source, available under the GPLv2 license. You can use it in your continuous integration test suites to detect SQL injection regressions. As you know your own software very well, you can configure sqlmap with a variety of parameters that will give it a “head start” as it will not need to figure out whether you are operating on MySQL, PostgreSQL, Oracle, etc. In addition to a very low-level API (JDBC in Java, native functions in PHP, etc. ), most platforms also have a variety of higher-level APIs that abstract the SQL language in a non-string-based way. However, don’t be tricked into thinking that SQL language abstraction itself keeps you safe from code injection. Popular frameworks like Hibernate or JPA use string-based query languages like HQL or JPQL. These languages are less vulnerable than SQL because they’re less expressive. But they are still vulnerable! In addition to being much safer from SQL injection through enforcing the use of bind variables, statically typed internal domain-specific languages also help prevent syntax mistakes. In the case of jOOQ, this is further supported by jOOQ’s source code generator, which will generate Java literals for tables and columns. Don’t just blindly use the MySQL root user with no sensible password for everything (or the postgres user in PostgreSQL, or the dbo user in SQL Server, etc.). Create a well-designed security strategy, where users are granted access only to those elements that they really need to access. Often, a good idea is also to add an additional layer of security indirection inside your database through database views. For instance, web users are granted access to a few read-only views, never to tables directly. This will allow you to dynamically restrict who can manipulate what data. This measure will not prevent SQL injection, but it will minimize the possible damage an intruder can cause, once they have penetrated your system. Form Protection: All acceptable values that can be chosen in a form are known to the entry server and validated using an encrypted hash. This makes it impossible to tamper with HTML <select>, <input type=”hidden”>, <input type=”checkbox”>, <input type=”radio”> values. Obviously, “threatening” user input can still originate from regular <input type=”text”> or <textarea> values. An example of an entry server implementing the above is Airlock by a Swiss company called Ergon Informatik AG. Even with recent alternative data storage and access models that have come to be known as NoSQL, SQL as a querying and database interfacing language is still hardly challenged. Major SQL vendors implement better and better features into the SQL standard. SQL is here to stay. Yet, many development teams are unaware of the magnitude of this threat. In millions of lines of application code, it can be sufficient if one SQL vulnerability is detected by a malicious entity operating with automated tools, such as sqlmap. Such an entity may be able to extract all data from your database, and / or execute malicious code on your servers. This can go up to seizing the server. It is a software architect’s or technical lead’s responsibility to minimise the risk of creating SQL injection vulnerabilities, as even skilled developers may accidentally create such a vulnerability. The simplest and most effective measure is to use bind variables and static SQL wherever possible. More elaborate countermeasures can be achieved by lots of training, screening, testing, and using entry servers. SQL injection is a web application problem, and not directly related to an ORM. ActiveJDBC will process any SQL that is passed to it. Is that really true? Should the database abstraction layer delegate SQL injection prevention to the client application? userName = "a';DROP TABLE users; SELECT * FROM userinfo WHERE 't' = 't"
statement = "SELECT * FROM users WHERE name = 'a';"
+ "SELECT * FROM userinfo WHERE 't' = 't';"
This doesn’t happen to you? it’s not that bad if one out of 500 statements is badly written by some programmer that was oblivious of this threat? // Implicitly creating a bind value for "Poe"
// Explicitly creating a (named) bind value for "Poe"
SELECT * FROM T_AUTHOR WHERE LAST_NAME = ? Full SQL abstraction. These include jOOQ, JaQu, JPA’s CriteriaQuery and others. Their normal operation mode will always render bind values in generated SQL. This prevents SQL injection in most cases. The others. Many other frameworks (including ActiveJDBC and Hibernate) are mainly based on (SQL or HQL) string operations. While they abstract many SQL-related things, they do not prevent SQL injection at all. So, when you choose any SQL abstraction tool in your Java application, beware of the severity of SQL injection. And beware of the fact, whether your tool helps you prevent it or not!